Our daughter surprised us this past weekend by getting into a fender bender with my car. It was a very minor incident and fortunately nobody was injured. However, now I was faced with the task of dealing with a couple of dents in my car. As you can see by the before-photo above, the damage was limited to two small areas. 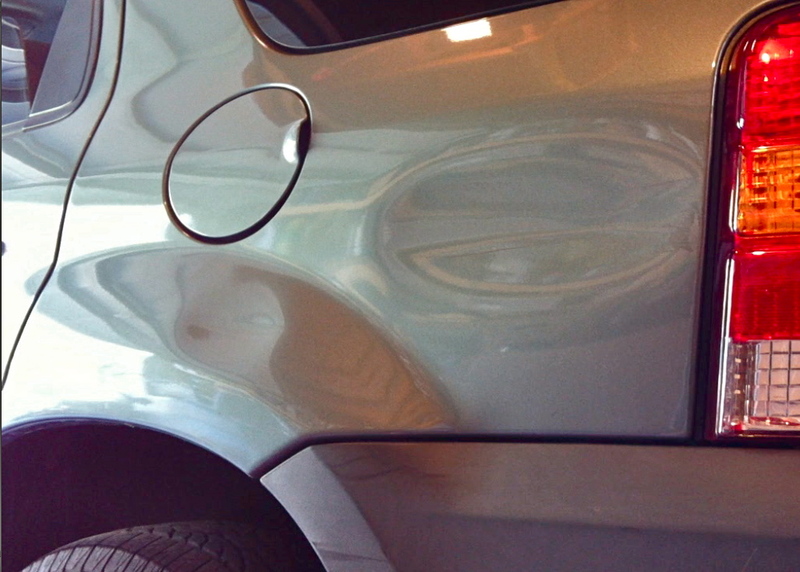 A large dent between the tail light and the gas tank filler door, and a small dent between the gas tank filler door and wheel well. Neither dent included any tearing of the metal or removal of the painted finish. It was just two simple dents. While I am not a body repair technician, I am an avid do it yourself kind of guy. It wouldn't be my nature to take this job to the body shop without trying to repair it myself first. If I could access the rear quarter panel from behind, I could probably push the damage out with ease. The problem that I faced; there was no easy way to access the body panel from behind. In this vehicle the space between the body panel and the interior trim houses a rear air conditioner unit that leaves no access to the body panel. I determined that I could try to pull out the dent by use of a suction device, or by drilling holes and using a dent puller. Well, I do not own a powered suction device, and purposely making holes in the car body would turn this into a more time consuming and expensive auto body repair project than what I was ready to tackle. Then I recalled reading about paintless dent repair services. Maybe there was a way that I could do the same type of repair myself? After some quick Internet searches, I found several videos of a technique that called for the application of a heat source (i.e. heat gun, hair dryer, or small torch) then a cold source (i.e. the liquid propellent used in compressed air dusters) to expand then contract the metal. The process was supposed to pop-out the dent, placing the body panel back into its original shape. Some of the videos demonstrated what was apparently a successful repair, while others were an obvious failure and claimed hoax. While I had no desire to play Mythbusters, the junior high school science fair aspect of the process intrigued me and I convinced myself that it was worth a try. I already owned a powerful heat gun that is intended for use in removing paint and softening adhesives. Think of it as a supercharged hair dryer, except that this model can provide temperatures that are close to 1,000º F (538º C). If I was not careful, the heat source would easily peel the paint right off the vehicle's body panel. 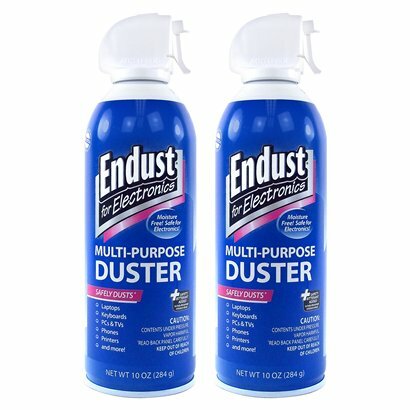 For the cold source, I stopped by the local Target and purchased a two-can pack of Endust for Electronics, Multi-Purpose Duster. The two-pack of 10 ounce cans was priced at $8.99. 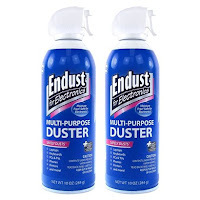 Typical of these kinds of canned air packages, Endust Duster contains Difluoroethane. In addition to serving as a refrigerant for air conditioners, Difluoroethane is also commonly used in many consumer aerosol products such as canned air dusters. Used as intended, the can is held upright and when the trigger is pressed, a stream of high-pressure air is released from the can. The dry, anti-static nature of the canned air makes it perfect for blowing dust and debris from sensitive electronic equipment. However, when the can is held upside down and the trigger pressed, the can releases a stream of the liquid Difluoroethane. As it is emitted from the can, the liquid has a temperature of approximately -13º F (-25º C). Definitely cold enough to cause frostbite or other possible injury to the user and anyone nearby. It's important to note that the canned air is NOT intended for use in this manner. The Endust Duster can has clear warnings that you should never hold the can upside down and release the liquid Difluoroethane. We do not endorse this use either and cannot be held liable for any injuries or damage that may occur from misuse! Now I was ready to give the process a try. First I heated the dent area with the heat gun, making certain to move the heat source over the affected area to provide even and thorough heating. Apply the heat for three to five minutes, or until the metal is very hot to the touch. Then, holding the air duster can upside down, quench the dent with the liquid Difluoroethane for about ten seconds. The liquid will create a frosty coating on the hot metal. Allow the frost to thaw and wipe the condensation dry with a clean cloth. 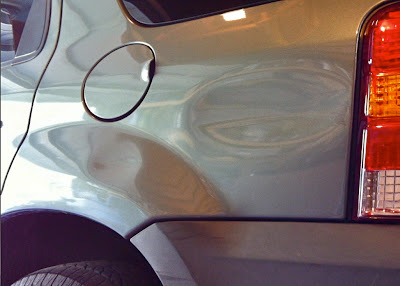 Depending upon the severity of the dent, you may see the damage begin to magically repair itself. In the instance of my two dents, I had to repeat the process a few times. However, it did work! In the un-retouched after-photo above, you can see that the large dent is virtually indistinguishable. 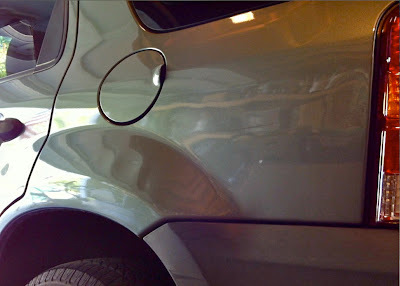 The small dent between the gas tank filler door and the wheel well is still slightly visible. Based upon this repair experience, I have concluded that the degree of success with using this method depends upon the location and severity of the damage. In my case, the large dent was located in an area of the body panel that was relatively flat and void of strength. That seems to have been a factor in my successful repair. The small dent was located along the curve of the wheel well and near the two arcing creases of the body panel. These features provide strength to the body panel and made repair of the dent more difficult. However, the process did in fact help to make the dent smaller and much less noticeable. The following two-minute video summarizes the repair process and demonstrates the instructions provided above. If you have any doubt that this process really works, watch carefully at the 1:05 mark where the large dent pops back into place. 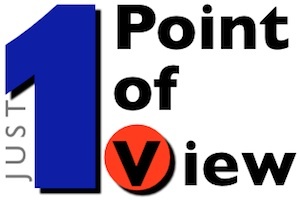 To view a larger, High Definition version of this video (much better than what I could place here within the blog), please follow this link to YouTube. So, can you repair dents in an automobile with a hair dryer and a can of compressed air? Yes and no. It depends upon the location and severity of the damage. But as I have demonstrated, with a heat gun, $9 worth of Endust Duster, and about 15 minutes, you can achieve some remarkable results.